The most important part of the Government’s Brexit plan is the line that ‘no deal is better than a bad deal’ and this is what distinguished the Conservative Party from all of the other parties in Parliament on the issue of Brexit. None of the other parties ever said it. Jeremy Corbyn simply said in his interview with Jeremy Paxman before the election that “there will be a deal” and refused to say how much he’d be willing to pay in terms of the “divorce bill”. Why do I think that this line is so vital? This is because, if you are not willing to ever walk away from the negotiating table, not even if your red lines are not met, then you do not even have a negotiation in the first place as John Redwood MP has noted. You are saying that you will accept any deal at all and that ‘any deal is better than a bad deal’, regardless of how high the “divorce bill” is, regardless of much or little free access we get to the single market and, crucially, regardless of how similar the deal is to EU membership. If the Government were to unwisely take Labour’s position here, the EU could offer us a deal which was EU membership in all but name and we’d have to accept it. This is very similar to what happened with David Cameron’s so-called “renegotiation” of the terms of our membership of the EU where he made it clear to the Commission President from the start that, regardless of whatever reforms he did or didn’t manage to attain, he would still campaign and vote for the UK to remain in the EU anyway. This then ensured that Cameron got a lousy deal which, in part, led the British people to vote to leave the EU. Labour’s position would be like looking for a new house and, in advance, deciding that you will definitely buy the very first house you come to without even looking inside it and regardless of how much it costs. The worst thing to do in any negotiation is to appear desperate for a deal and to seek a deal at any cost. For Labour, in the words of Peter Lilley, “no price is too high, no concession too grovelling to accept”. We are by no means mere supplicants in this negotiation – quite the opposite in fact. The Governor of the Bank of England, Mark Carney, whose words were constantly quoted by remainers during the campaign has said that if there were to be no transitional Brexit arrangement, the ‘financial stability risks’ would be worse for the EU than they would be for the UK and Michel Barnier has admitted that no deal would be a ‘bad’ outcome for both the UK and the EU. This is why he has stated that he would like to see a ‘special’ deal with the City of London on financial services after Brexit and why the EU’s own Trade Commissioner, Cecilia Malmstrom, has said that there will be a free trade deal with the UK ‘for sure’, backing down from her original stance last year that trade negotiations could only begin once we’d officially left the EU. A free trade agreement with the EU is by no means necessary and we could survive and manage without one. The property developer, Richard Tice, and the former Director-General of the British Chambers of Commerce, John Longworth, have both said that a free trade deal with the EU would just be the “the cherry on the icing of the [Brexit] cake”. It’s also worth bearing in mind the facts about the most unlikely and worst case scenario of the UK leaving the EU with no deal at all. Firstly, the House of Lords’ EU Financial Affairs Committee has stated that the UK would have no legal obligation to pay the EU any “divorce bill” if we were to leave without a deal. Secondly, 6 of the EU’s 10 most important trading partners trade with the EU on World Trade Organisation (WTO) tariffs. Thirdly, we already conduct 56% of all of our trade (our trade with the 163 or so non-EU countries) on WTO tariffs. 70% of the UK economy is domestic, 17% is exports to non-EU countries and only 13% is exports to the EU. The EU’s share of global GDP (PPP) is significantly shrinking – it was 30% in 1980 but was just 17% in 2015. Over the next 10-15 years, 90% of global economic growth will come from outside of the EU. The fastest growing economies such as China and Hong Kong are outside of Europe altogether and non-EU countries such as Switzerland have free trade agreements with many of them. The organisation “Change Britain” has estimated that the UK’s potential post-Brexit free trade deals could be worth £12.3bn. Fourthly, as we have such a large trade deficit with the EU (£60bn in 2015) and as the EU exports much more to us than we export to them, the EU would, in total, have to pay twice as much in tariffs on their exports to us as we would on our exports to them as Mr Redwood has pointed out. Even if you add up all of the tariffs the EU could put on all of our exports to them, it is equivalent to less than half of our annual net EU membership fee. The average most-favoured nation tariff on exports to the EU is less than 5% and just 2.3% for non-agricultural products. Finally, the Government has been and still is preparing for all possible outcomes of the Brexit negotiations, including no deal at all. As the former MP and former Secretary of State for Trade and Industry, Peter Lilley, has pointed out, we should instead focus on capitalising on the advantages of leaving the EU, its internal market and its customs union. The first advantage is that we will once again have full and permanent control of our trade, our laws, our regulations, our money and our borders. The second is that we’d once again have our own independent seat in our own right on the WTO and would have full and independent membership of the WTO in our own right. The final advantage is that we’d have the ability to strike our own free trade agreements with the 163 or so non-EU countries. The Prime Minister of Hungary (one of the 27 remaining EU member states) said on July 10th that no Brexit deal would mean “big trouble” and a “nightmare scenario” for Europe (watch it here: https://www.youtube.com/watch?v=5THYyL-ol_k). This just reinforces the point which I make in this article which is that we are not mere supplicants in this negotiation – quite the opposite is true. The EU and its member states have made it clear that they, like the UK, are also aiming for a free trade agreement and are very eager indeed to avoid no Brexit deal. This gives the UK huge leverage in these negotiations as the EU and its member states are likely to, at least eventually, back down from their stern positions and are likely to approve a good free trade agreement for the UK as they are very anxious to avoid no Brexit deal. So all of the parties should get behind the Government’s line that ‘no deal is better than a bad deal’ to ensure we have the best chance of getting a good Brexit deal. And if we enact unilateral free trade with everyone, then the cost of the goods and services we buy will fall by around 9% according to Condon, Minford and others. I don’t understand why so many Remianers and reluctant Leavers like Hammond ignore this simple and indisputable fact – do they not want everyone in the UK to have cheaper stuff, which then means they can buy other stuff from say UK producers? What about EU exporters to the UK? ‘No deal’ could mean redundancy for some German car workers for example if UK sales take a dive, so there’s going to be pressure on the EU side for a fair deal. There was some posturing from German politicans a week or so back saying manufacturers would rather take the hit than compromise the EU’s ‘four freedoms’. However, some of the manufacturers have since said the opposite, and BMW’s decision to manufacture the new all electric Mini in Oxford speaks volumes. Unfortunately students see the EU as the bank of Mum and Dad, that will support them if they screw up. Moving out of the house/EU is terrifying for them. They fear austerity, with no real reason. For them austerity is not having the latest stuff. What they need to understand is that the UK and Germany are a large part of the bank and money will run out if the ‘children’ don’t learn to stand on their own feet. It’s not austerity to live within your means. They don’t understand negotiation because they’ve discovered that screaming until they get what they want works. They’re really very cross with us for not doing as we were told. Some of them even want us to get a bad deal so that they will be proven right. They seem to think we can press an Undo button. The only area where we should genuinely wonder about the outcome is financial services. It’s worth a lot to London and hence the rest of us, but I don’t know the true position on it. I don’t doubt that clearing of Euros will move to the EU, it’s a bit cheeky to have it here now, but British banks and services do a lot of other business in the EU. Since a lot of the money they do business with belongs to us, not all of it can be relocated, even if the bankers wanted to make the move. I understand that you wouldn’t borrow/invest in foreign banks as easily since there are all sorts of rules about moving money in and out but if the sums are good enough, people do it (see David Cameron). The TV is no good at explaining because they pretend that it’s all or nothing and that’s just not the case. The politicians have almost all gone mental and couldn’t explain their breakfast, never mind Brexit options. 1. The Secretary of State for Environment, Food and Rural Affairs, Michael Gove, has said that traditional food price protections for UK farmers will remain in place after Brexit. Therefore, cutting tariffs unilaterally would have no effect on food prices for UK consumers and food is a vital necessity/normal good. 2. Under the WTO’s rules, it is illegal to use tariffs to treat some WTO members (in this case the EU and all of its 27 remaining member states) less favourably than other WTO members (in this case all other non-EU WTO members). We would, therefore, have to unilaterally cut tariffs across the board for all other WTO members, including the EU and all of its 27 remaining member states. The £12.3bn in revenue we’d collect from tariffs on EU goods imports could be invaluable. It could help the Government to fund a corporation tax cut which would help UK firms and could help to attract firms to set up in the UK or relocate to the UK. Unilaterally cutting tariffs could make life very difficult for domestic businesses and firms, especially if as is highly likely, the other WTO members don’t reciprocate by unilaterally cutting tariffs for all other WTO members, including us (they haven’t done so significantly before so why should they now?). Ben, welcome to the talkshop and thanks again for your permission to reblog your article. It’s great that you’re laying out the facts in a clear and well packaged way here. I’ll be posting your other articles when I hear back from the original publishers. The simple fact is that the EU exports far more to the UK, than the UK exports to the EU. IF the EU gets pissy and forces a “no deal”, it is the EU that gets hurt most. Mostly German car makers. So the UK can just skip the Mercedes and BMW … it isn’t like you can’t build your own cars or buy from the Japanese, Koreans, Americans, whatever. The numbers make it pretty clear, the UK would be better off with trade deals with the USA and former commonwealth States and selling to the EU on WTO terms. The USA, Canada, Australua, New Zealand, etc. Are ready to make quick clean deals. I’ve negotiated a LOT of contracts. Best strategy right now is to get an “agreement in principle” for free trade with the USA (and others if possible quickly) to be signed at BREXIT, then look at the EU and say “give us a good free trade deal, or we walk”. THEN SHUT UP.The first one to talk loses. Just wait quietly until offered what you want…. or walk away if you don’t get it. E.M.: Good advice. I have some confidence in David Davis as our chief negotiator. I’ve met him in person and I think he’s made of the right stuff. Problem is, P.M. May has the ultimate say on how he finishes the job. The tory party is more than half pro-EU. The previous P.M. and most of his cabinet campaigned to remain. The electorate may have been premature with its return to two party politics, abandoning UKIP. We are hanging in there in case we’re needed, but have been heavily damaged by the loss of support at the last general election. We’re not rich people, and most of us lost candidates deposits. oldbrew, not necessarily. What you can do is pick and choose who you concentrate on without being hauled up to the EU court for racial profiling. The EU is in double trouble if it doesn’t get a deal because while not every country exports much to the UK, the big contributers to the EU funds do. They will lose both our contribution and some of the cntribution of our big trading partners like Germany. Even the fear that businesses will relocate are unfounded because the market in the UK is valuable in its own right. Even businesses like Cadbury’s might move production back rather than pay an import tarif. Especially if we have a trade deal with the US and the EU doesn’t. It really is the city’s access to the EU that they’re dancing round. Germany and France hope to supliment any losses with our banking and services sector. 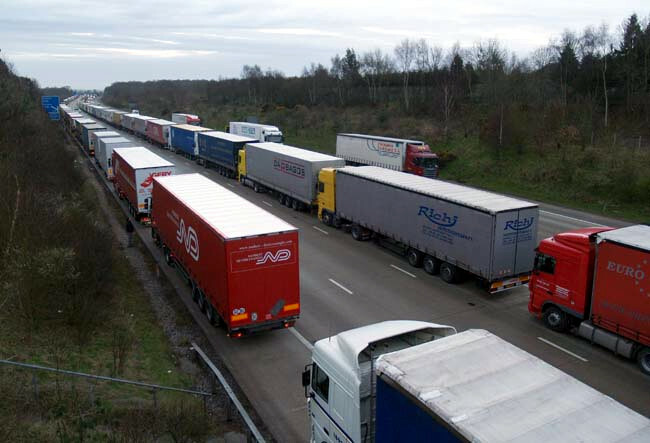 Tiny – if the EU wanted to play hardball it could stop and check every British truck on arrival/departure.